I've discussed water many times and it is good to hear other people recognizing water use as the next issue after electricity in a Green Data Center. When I wanted to learn more about water I actually went to a Ground Water Conference 2 years ago http://www.ngwa.org/. The WSJ had an article about how the rich are drilling wells when local water municipalities have limited water use. Lawns are parched and brown across much of the Southeast, roasted by a 28-month-long drought and new policies restricting most watering to nighttime hours. But in Atlanta's tony Buckhead neighborhood, sprinklers were spurting energetically on a recent day across the verdant blanket of fescue grass in front of the home of James B. Williams, former chairman and chief executive of SunTrust Banks Inc. and a Coca-Cola Co. director. 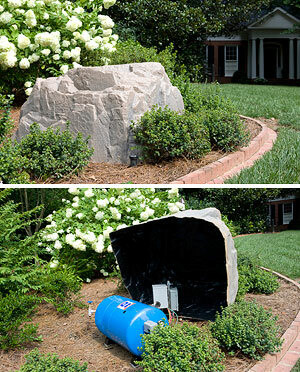 A faux rock hides the well in front of Sarah Courts's home in Atlanta. Hidden behind nearby shrubbery on the four-acre estate is Mr. Williams's new toy -- a 400-foot-deep well. "Sprinkler System Not on City Water," declares a small white sign pitched at the entrance to Mr. Williams's driveway. Mr. Williams's landscaper placed the sign there to thwart neighborhood vigilantes from ratting him out to water authorities. "I didn't want to give the impression that we were doing something we weren't supposed to do," Mr. Williams says. Metro Atlanta's midnight-to-10 a.m. watering restriction doesn't apply to well owners who pump less than 100,000 gallons a day -- way more than any homeowner would use. (It takes about 20,000 gallons to fill a swimming pool.) So Mr. Williams uses his well to water as often as he likes. Mr. Williams is one of hundreds of wealthy homeowners in the Southeast who are skirting watering restrictions by tapping an ancient source to keep their lawns lush and pools full. In their eyes, there is no way to keep their grass green and flowers blooming without watering often -- or putting down hundreds of thousands of dollars to replace their landscaping every year. But the practice has enraged water conservationists and other less-well-heeled homeowners. Water well drilling is easier in the SouthEast as water rights are different in the Western vs. Eastern US. In the East where there have not been water shortages in the past, you own the water rights as part of your land, Riparian water rights. In the West water rights are usually Prior Appropriation water rights. Prior appropriation water rights, sometimes known as the "Colorado Doctrine" in reference to the U.S. Supreme Court case Wyoming v. Colorado, is a system of allocating water rights from a water source that is markedly different from Riparian water rights. Water law in the western United States generally follows the appropriation doctrine which developed due to the scarcity of water in that area. The legal details vary from state to state; however, the general principle is that water rights are unconnected to land ownership, and can be sold or mortgaged like other property. The first person to use a quantity of water from a water source for a beneficial use has the right to continue to use that quantity of water for that purpose. Subsequent users can use the remaining water for their own beneficial purposes provided that they do not impinge on the rights of previous users. Beneficial use is commonly defined as agricultural, industrial or household use. Ecological purposes, such as maintaining a natural body of water and the wildlife that depends on it, were not initially deemed as beneficial uses in some Western states but have been accepted in some jurisdictions. The extent to which private parties may own such rights varies among the states. Water shortages will continue to increase in the world, and will become in a new factor in a Green Data Center. Digital Sense's Michael Tran is building a water neutral data center in Brisbane Australia as the country is in a severe water shortage. Water is not used in the cooling systems as they would not get the building permits to build a typical data center cooling system with water cooled chillers.